This mod adds brand new, modern throwing weapons mechanic, as seen in Metro, COD, Fallout 4 and some other FPS games. The aim was to make it look and feel like it was always in the game. Fixed proxy creature constantly detecting player. Fixed missing weapon effects and impact data sets. Fixed critical bug that applied player's main weapon characteristics to Quickthrow weapons on hit. Comes with a tradeoff - you won't get hitmarkers for quickthrow hits, if you are using hitmarker mods. Added ability to turn on/off Adaptive Aim. Some people prefer eyeballing their throws, and some other want just a little bit more performance on older machines. Fixed (this time properly) weapon type selection. Added compatibility for iHUD/oHUD. Grenade icon is connected to the Action Points bar. 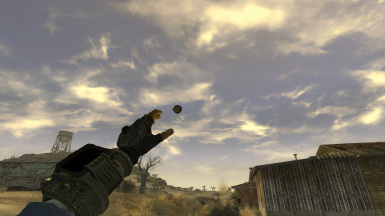 Fast left-handed throw for all throwing weapons (grenades, mines, melee), including those that are added by mods. Full support for 1st and 3rd person. Other smaller features and quality of life improvements: sounds, icons (not nice ones though), weapon selection memory, throwing power gauge, middle mouse button support for throwing, MCM configuration. Install and play. It's that simple. Controls mimic Project Nevada, so if you're used to it - you'll feel right at home. Throw weapons with G key, select by pressing H, change weapon type (grenade/mine/melee) by holding H, and to reset throwing in progress - press R.
All keys and HUD elements are configurable via MCM. This mod haven't been tested with animation packs/replacers. Be aware of that. If you see adaptive aim acting weird (for example, throwing knives hitting far from the crosshair) - don't hesitate and report immediately. ﻿To make it work, custom 1st and 3rd person skeletons replacement is necessary. Due to this issue mod is incompatible with any other mod that changes skeletons until patched. Quickthrow is compatible with my mods from the start (Weapon Inertia and Diagonal Movement), but make sure Quickthrow is installed last. Incompatible with any mod that changes 1st or 3rd person skeletons, at least until it's patched. If you are playing at very low FPS (less than 30) - it will lead to slight throwing animation offsets. Aiming too low with melee weapons - you might hit yourself. Same with mines. You won't take damage, but it's still an annoyance. Install required mods first. They are essential and without them – this mod will not work. "B42 Quickthrow" mod installs like any other mod, manually or using a mod manager. I recommend the latter for easy uninstallation. Same as installation, in reverse.